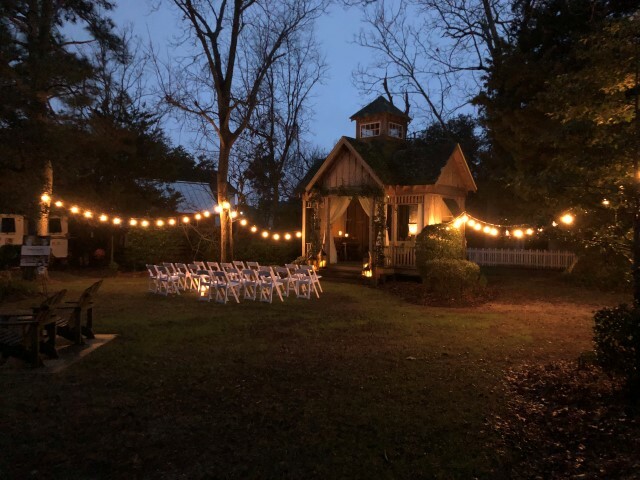 The Outer Banks Wedding Association holds its annual Wedding Expo every year on Martin Luther King, Jr. weekend in January and we were excited to participate this year! We had a booth at the show, and also worked with some local vendors to set up a ceremony in our garden as a tour stop! Saturday night, brides and grooms from the show go around to local venues and get a better feel for them in person. It was so fun putting it all together. We had the best time meeting all the brides and grooms, their friends and family, and lots of local wedding professionals and introducing them The Roanoke! 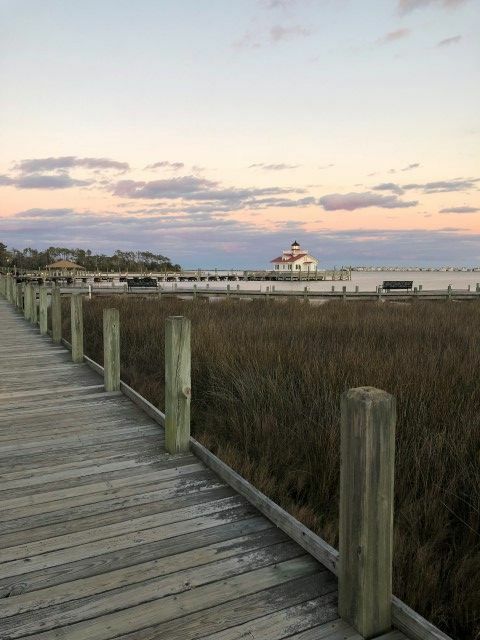 As some of you may or may not know, downtown Manteo suffered significant flooding due to Hurricane Michael in October. While we are incredibly fortunate to not sustain any major damage to the inn, the bungalow was not so lucky. About 16 inches of water ended up inside. 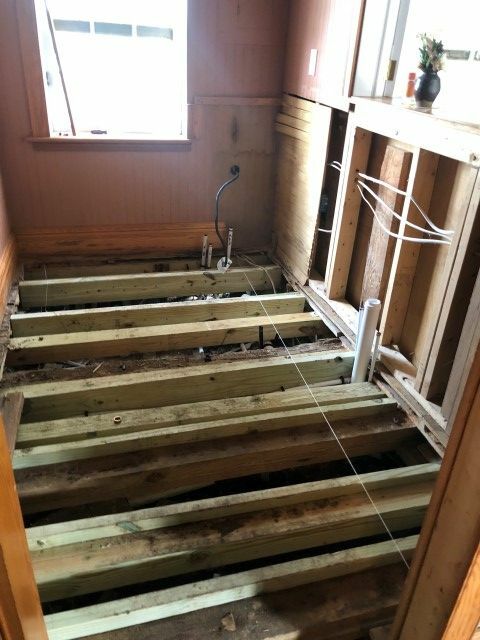 The floors in the kitchen and bathroom were already in need of some attention, and the flooding this past fall was the final straw. In January, we started our mini overhaul of the kitchen and bathroom and are so excited to show you the results! New floors, new bathroom, new kitchen and furniture refreshing are all on the list. The koi pond gets drained and cleaned every few months, but while we are closed is a great time to also address any leaks or cracks since it usually means having the pond empty for several days. 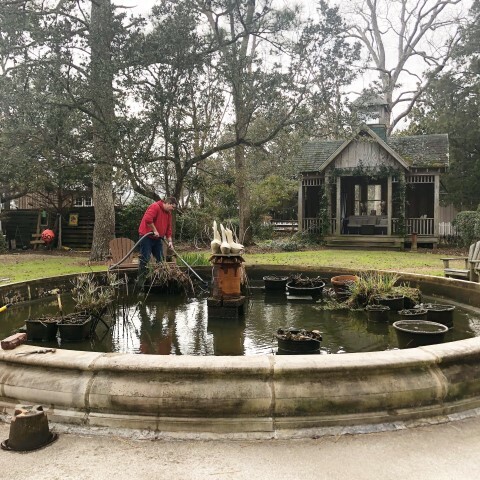 It is a pretty dirty job and process, but our resident koi pond caretaker (read: Jason) does an excellent job. The inn environment is conducive to needing refreshing often. The salty breezes we adore reek havoc on just about everything it touches (less the human body, mind and soul! ), coupled with the fact that we welcome hundreds of guests into our home each year, this places takes a lot of wear and tear! We got through all the rooms and common areas and assess any furnitures or fixtures that need repairing or replacing, and also start the process of repainting. Walls, ceilings, doors, shutters, rocking chairs - you name it! 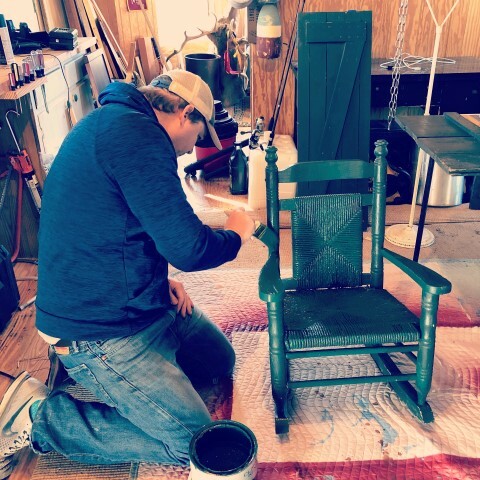 Just about everything around here gets a touch up or completely new coat of paint! Thats right! We are taking a vacation to Virginia to visit friends and family and relax. Even though we love where we live and what we do, it can be hard to turn off. Staying around the inn and relaxing usually turns into kind of relaxing while doing a project or making a list of the projects we need to do. We are looking forward to removing ourselves for a while to relax and reconnect with the people we love most! Also on that trip home, Jason and I are taking a mini vacation without our littlest innkeepers! Any guesses where are headed?? Somewhere warm or somewhere cold? Place your bets and stay tuned! !